Based on the 1986 Stephen King bestseller, the new film It opens with a scene that will be familiar to those who experienced the 1990 miniseries: young Georgie Denbrough (Jackson Robert Scott) is seen chasing his paper boat down a flooded street until it falls into a storm drain. 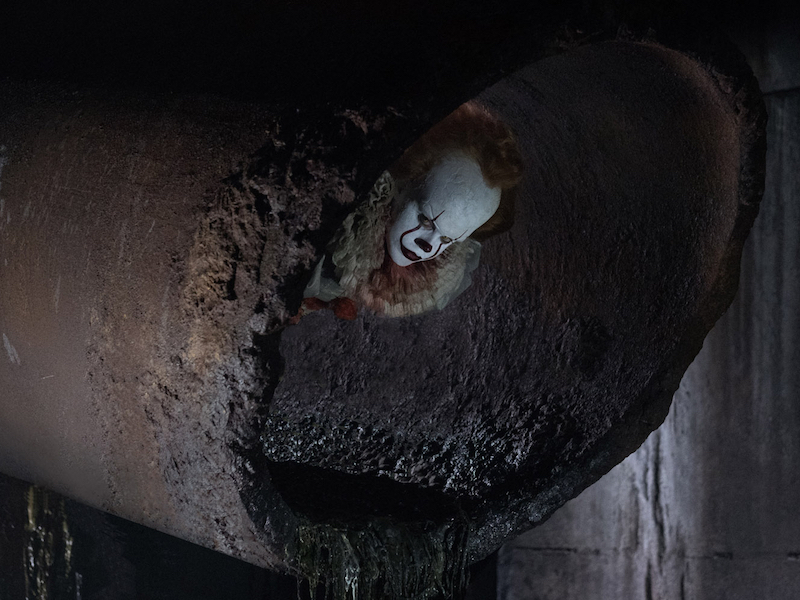 Upon trying to retrieve it, he encounters a sewer-dwelling clown figure who introduces himself as Pennywise (Bill Skarsgård) and offers him a balloon before violently murdering him. It turns out that Pennywise is the manifestation of an evil that’s plagued their town of Derry for many years and after it terrorizes a number of children in the area, Georgie’s brother Bill (Jaeden Lieberher) forms a group called The Losers Club with other affected kids in order to avenge his brother’s death and put a stop to the malevolent force. One of the most notable deviations from the source material is resetting the events from the 1950s to the tail end of the 1980s, which not only allows for pop culture references that range from Tim Burton’s Batman to New Kids on the Block but also puts the film in the same timeframe as the mega-hit Netflix series Stranger Things, itself largely influenced by King’s novel. It’s a smart move, given how popular this brand of nostalgia has become the past few years but it also strengthens the coming-of-age angle that sometimes gets upstaged by the clown-centric scares from the original story. With its focus on themes of friendship and loyalty, audiences may be surprised how much this movie bares a resemblance to something like The Goonies (there’s even a cruel variation of the Truffle Shuffle performed by one of the bullies) or Stand By Me as opposed to more traditional horror fare. Having said that, the marketing of It still hinges largely on the menacing presence of its eminently creepy antagonist and director Andy Muschietti does not skimp on chilling scenes designed to send those with coulrophobia running out of the theater in droves. Skarsgård had some big clown shoes to fill when taking up a role that Tim Curry crafted with terrifying perfection in the aforementioned miniseries and if his work here is comparatively lacking, it has more to do with this update’s reliance on computer-generated effects to amplify his performance rather than a deficiency in Skarsgård’s abilities as an actor. For all of the flaws present in the 1990 version, the visual conception of Curry’s Pennywise and its use of simple, practical effects (the less spoken of the claymation, the better) remain first-rate to this day and I wish this 2017 iteration retained some of this more reserved aesthetic. The rest of the young cast is generally filled with lesser-known actors, save Stranger Things’ Finn Wolfhard as the hilariously foul-mouthed Richie, but the talented bunch of kids do a convincing job of conveying fear in ways that feel fitting to each of their characters. Standouts include Jeremy Ray Taylor as the overweight Ben and especially Sophia Lillis as Beverly, the lone girl of the group who’s a bit wiser and more mature than her male cohorts. Fans of the book won’t be surprised that this production team is planning a Chapter Two following this film’s impending success that focuses on the adult lives of the Losers Club members and I would be shocked if they don’t already have Amy Adams in talks to play Bev’s grown-up counterpart. It’s no easy task adapting unwieldy source material like a 1000+ page paperback and while the common practice is to abridge or even omit large sections of a given plot, I was delighted with not only how much of the story remained in the film but how many minor details were included as well. Even with a second installment on the horizon, this first chapter clocks in at a hefty 135 minutes and while there obviously was room for more judicious editing, I have to give the creators credit for pushing towards a more thorough adaptation this time around. Their love and respect of the book shines through in their interpretation and makes It a spectacle of horror with no shortage of heart and humor too.